It's done! I have to admit that I'm surprised that I finished it in time for the August One Monthly Goal (OMG) deadline. 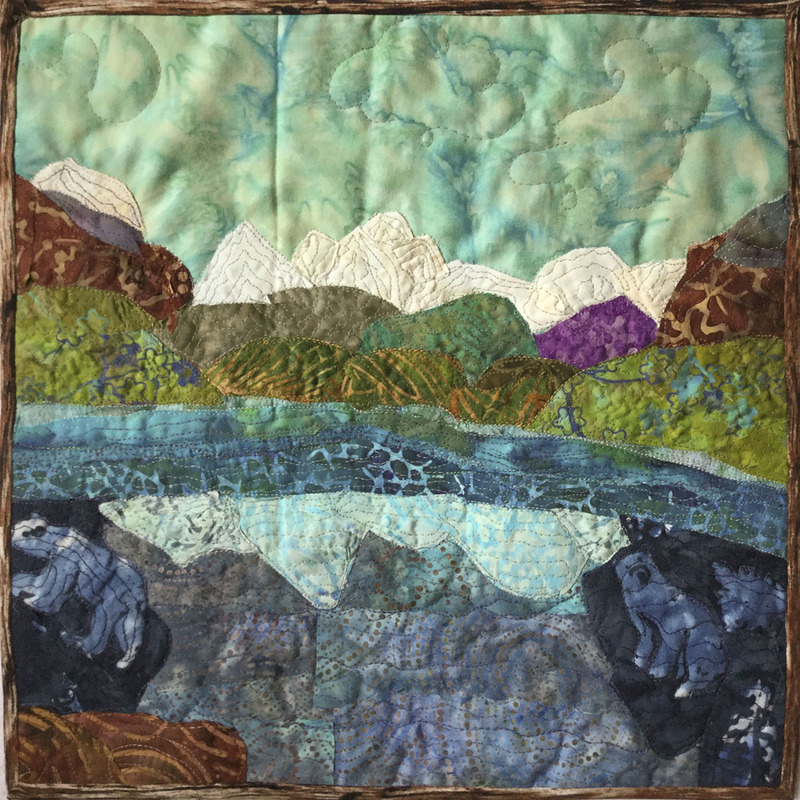 Funky Mountain Landscape Quilt is finally finished! I really enjoyed working with the batiks. It adds some great colour to a traditional landscape. This is the photo that started it all. It was taken on a trip to British Columbia a few years ago. The thread sketching certainly helped define the mountains. Finally I didn't embellish this piece. I think that the polar bears in the fabric are enough embellishment or whimsy. 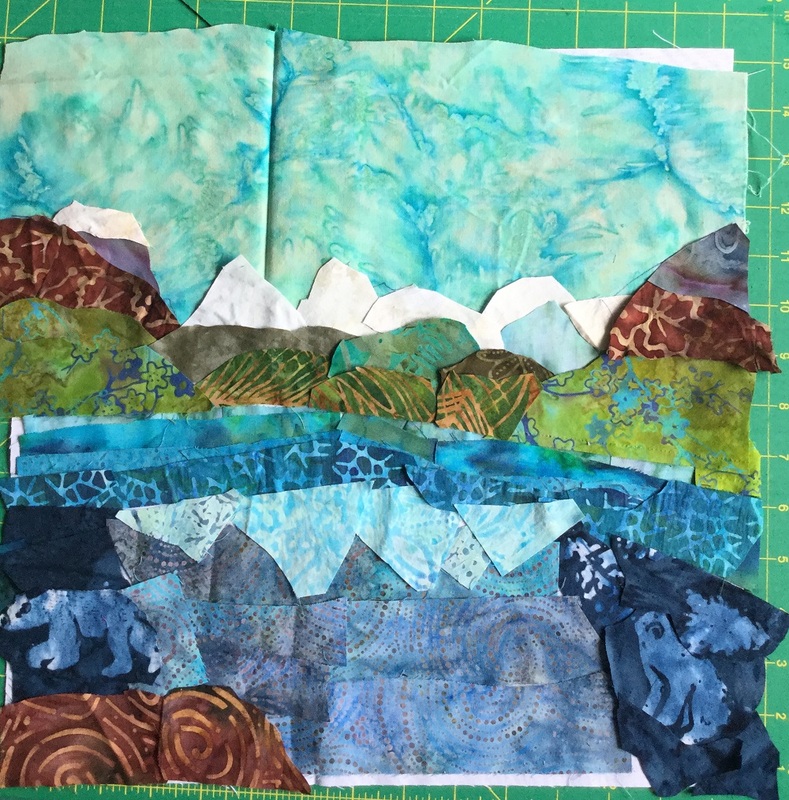 The hardest part about making this landscape quilt was determining when to stop thread sketching and when to start quilting. In hindsight, I should have done less thread sketching on the water. 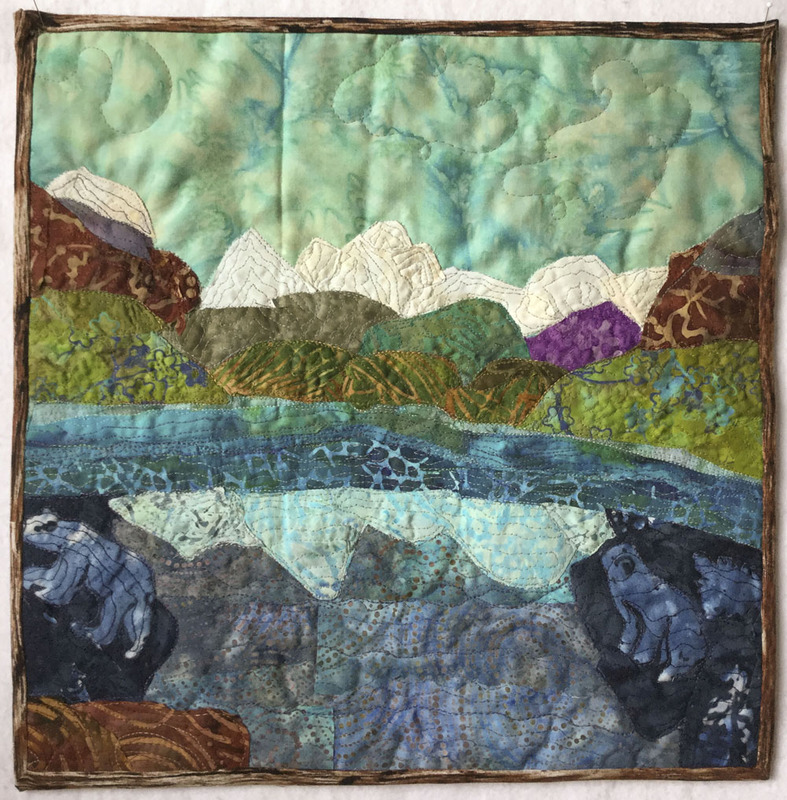 This would have given the water section of the piece a little more dimension then quilted. On September 13, 2018, I'll be taking part in the Welcome To My House Blog Hop. I've got a funky house that I hope to finish up this Labour Day weekend. Techniques: raw edge appliqué, thread sketching, quilting. 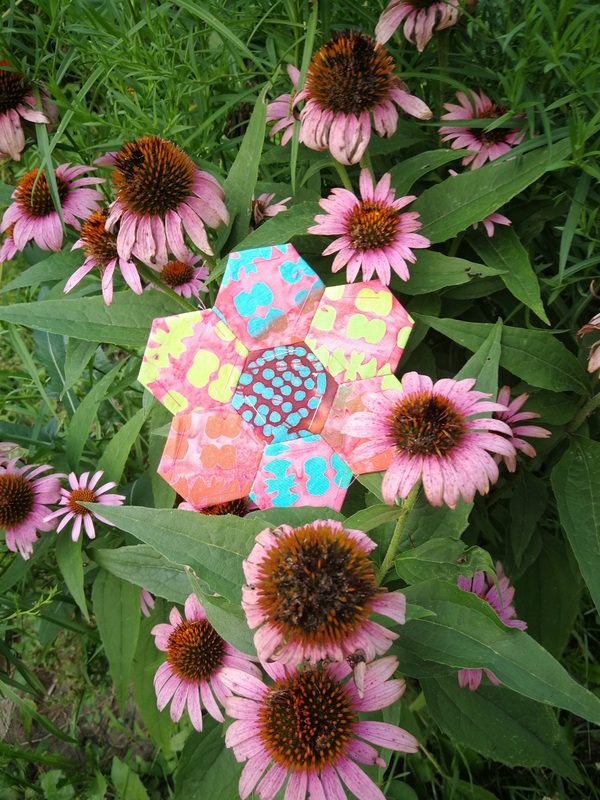 I am participating in the 100 hexies in 100 days event (#100hexies100days2018) which began August 6, 2018. 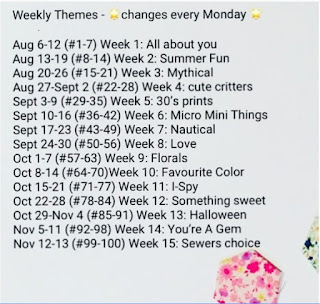 It's hosted by Sew Foxy Mama (sewfoxymama) and takes place on Instagram. I'm new at Instragram. Events like this are a lot of fun because I can just go to the event tag and look at everyone's posts. 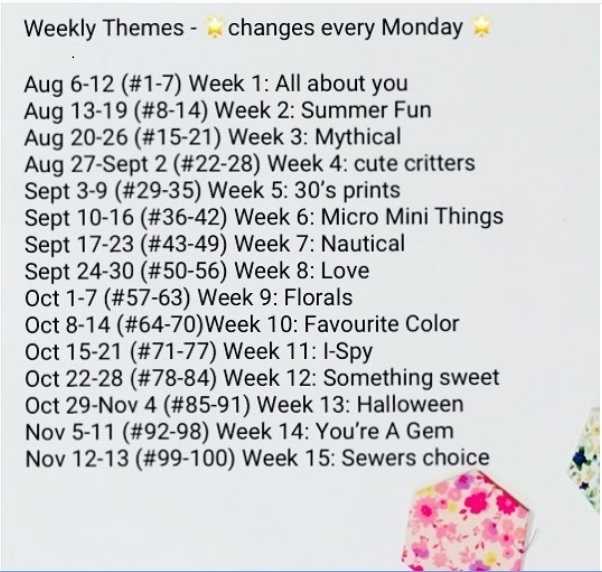 Each week has a different theme. 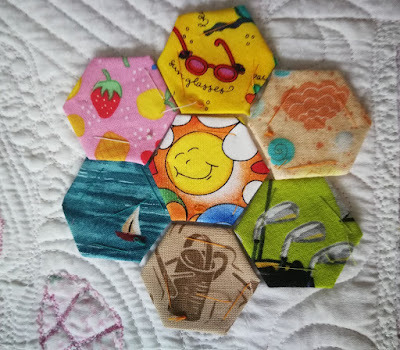 The hexies can be made with fabric following the theme, or the images can be shot in surroundings that illustrate the theme. It's been so much fun seeing all of the yummy fabric and great ideas for pictures. 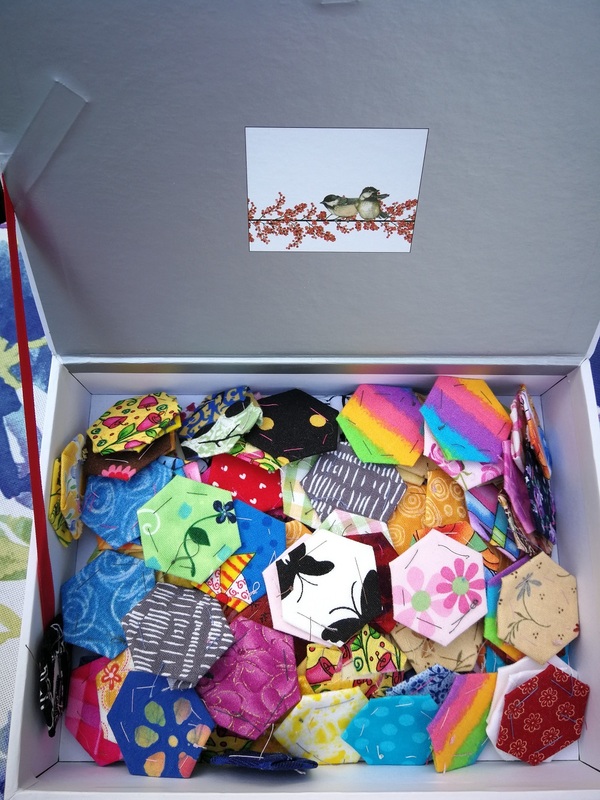 We can post one hexie each day, or the 7 hexies together on one of the days of that week. I post once a week because I'm sure that I would forget to post every day. It was great to read everyone's posts and see their images. I had a crazy week (aren't they all?!) and so I used images of hexies that I had already. I also included pictures of the Kingfisher Stitch-Along hexies that I had just finished, with flowers from by backyard jungle. Aren't these tall rudbeckia amazing? 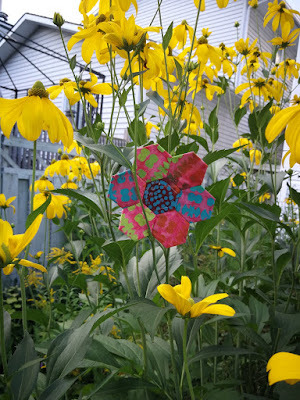 This was an easy week since my scrap bag had lots of fabric depicting summer fun. I even put in some golf clubs for my husband since he loves his golf. I took the pictures on top of the first door hanging I made. I have one for each season, and this one is for summer. This week's theme was interpreted rather loosely since I don't have much mythical fabrics. 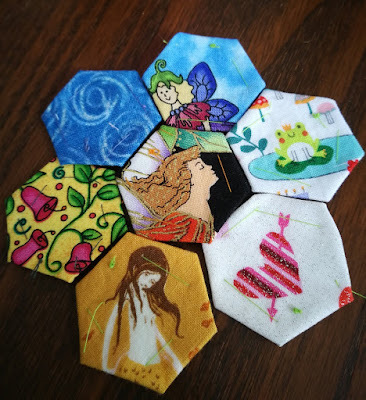 I did have a few fabrics with fairies, angels, mermaids and the frog prince. It's a bit of a stretch, but Cupid is there, represented by one of his arrows. 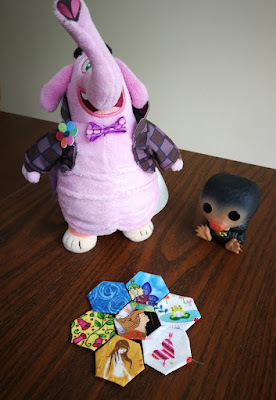 I took out my plush Bing Bong (from the movie Inside Out) and one of my daughter's figurines. I confess that I didn't know the name of the plush, or the movie (which I did see and liked) - thank goodness for Google! Bing Bong sits by my sewing machine and is my Muse, reminding me to believe in myself and my imagination. I can't believe that I forgot to mention this - I will be taking part in the Welcome To My House Blog Hop on September 13, 2018. I'll remind you when the fun starts. Since making these hexies, I've started sewing them together in flower shapes. I'm sewing all of the flowers without hexies between them so they won't look like flowers once the're all sewn up. This is going to be a purely scrappy project for when I want or need something mindless to do. No thinking allowed!!!! As much fun as it is following everyone's progress on Instagram, it would be nice to have a blog component to this event. 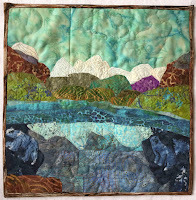 I really like reading about quilter's journeys, their choices and their work. 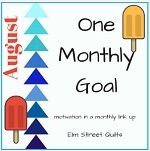 I like participating in Elm Street Quilts’ One Monthly Goal (OMG) because it helps me review my commitments for the month as well a sorting out details such as what and when I will post. I first mentioned this project on February 4th of this year. My famous last words "My goal for To-Do Tuesday this week is to start on this quilt by auditioning fabrics. 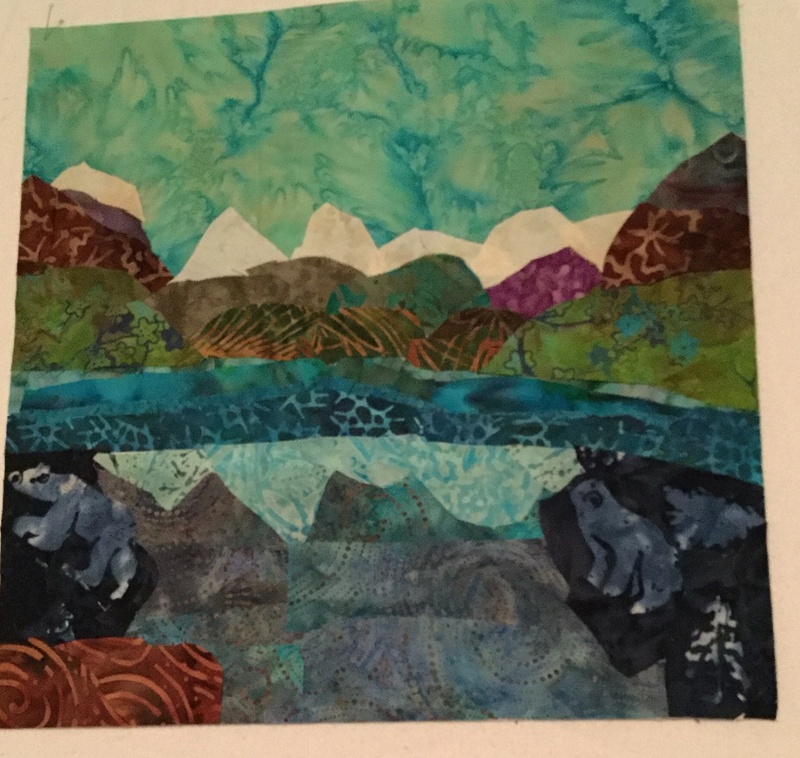 If it's going to be a funky landscape, I'm thinking that some colourful batiks could be cool." At least I can say that it will be batiks but my schedule is a little off....I started looking at fabrics last week! Here’s the photo that I’m using. It was taken on a trip to British Columbia a few years ago. My biggest problem was, and still is, to make it funky or more abstract rather than realistic. From what I’ve read in art books, it would seem that I’m not the only one to have that difficulty. Here’s what it looked like yesterday. Tonight I glued the fabric down and made some minor changes. The colours of my images are not very good since it's night time. It’s not quite as funky as I want, but I know that the piece will evolve as I thread sketch the fabrics, quilt it and then embellish it. Over the years I’ve learned that using photos can really help me see more objectively. For this project I’ve used photos extensively to decide on the fabrics I want to use. The first picture above was my sixth and I did make a couple of changes while gluing it down. As I was writing this and looking at the first picture, I realised that the reflection of the mountains in the water didn't match the mountains. It's a little better now. All the fabrics come from my stash (mostly my scraps), but I’m not thrilled with a couple of them. I’ll hoping the thread colours I use will adjust them to what I’m looking for. 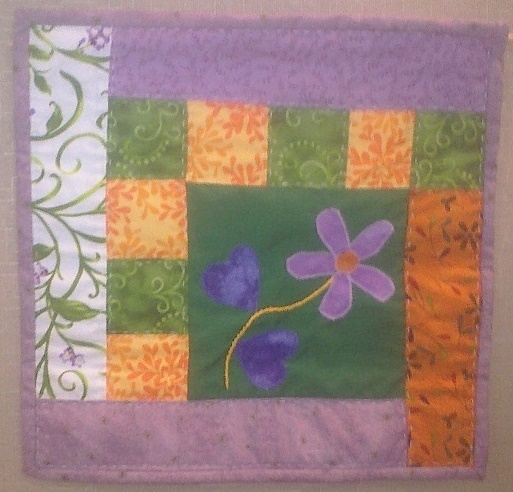 From 2009 to 2012, roughly when I first started quilting, I worked on assignment at another department. It was a great opportunity in which I learned a lot and met some wonderful people. 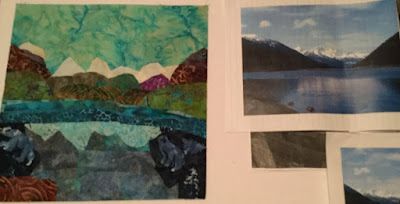 I didn't post any of these minis, but I would have started making them about a year before I started the Quilting & Learning - What a Combo! blog and finished them in my first year of blogging. It all started with a doll quilt that I made for a colleague's daughter (which I never took a picture of). After that I decided to make a little something for a few of my colleague's cubicles. These three are the ones that I have pictures of. Roses and butterflies was made for Sharon. She's an ex-librarian and a real sweetheart. I used some of my favourite fabric to make this. 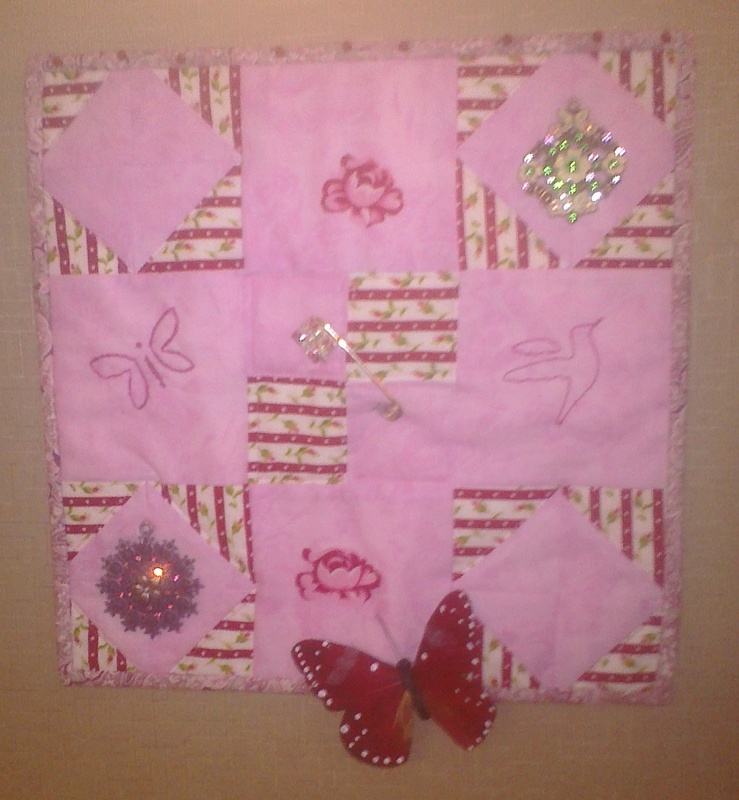 I embroidered the bird and butterfly and appliqued the two roses from another fabric in that line. I then added chunky jewelry for some interest. I'm glad that I still occasionally see Sharon at information management (IM) meetings. I made this for Kara - she was a funny, vivacious person who lost her battle with cancer a few years ago. I don't remember where I got the pattern for this block, except that it was part of a larger quilt that I adapted. The flower was appliqued and I think the stem was couched. I also made a quilt for her son. I did post that one. If you're interested in seeing it, the link is in the Related links section below. This mini is the last one I made before finishing my assignment. It was for my funny, charismatic and kind boss, Karl. We all called him "Patron". 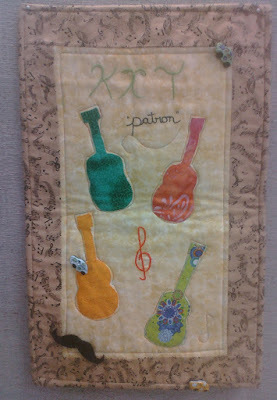 You can see in this quilt his love of music, mustaches and retro. I added the VW beetles for something retro but I remember that he loved retro appliances in particular. Again, I'm always glad to see Karl at our IM meetings. 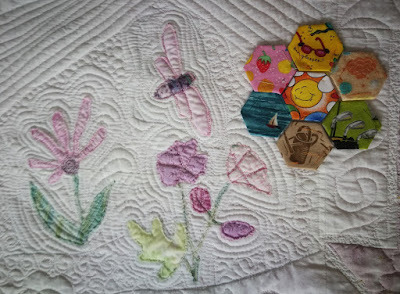 I remember making Sharon's mini quilt. I had a few fat quarters from a fabric line that was just perfect for Sharon. Unfortunately I used the loveliest one for the backing. I still remember that lesson! That's why I appliqued a couple of the roses to the front. I think that the first two minis were hand quilted while Karl's mini looks machine quilted. I would probably have used a walking foot.